Sidney Slon/Pipe Dream Photographer Sophomore forward Kaylee Wasco posted a career-high 14 points in a road loss against Stony Brook. 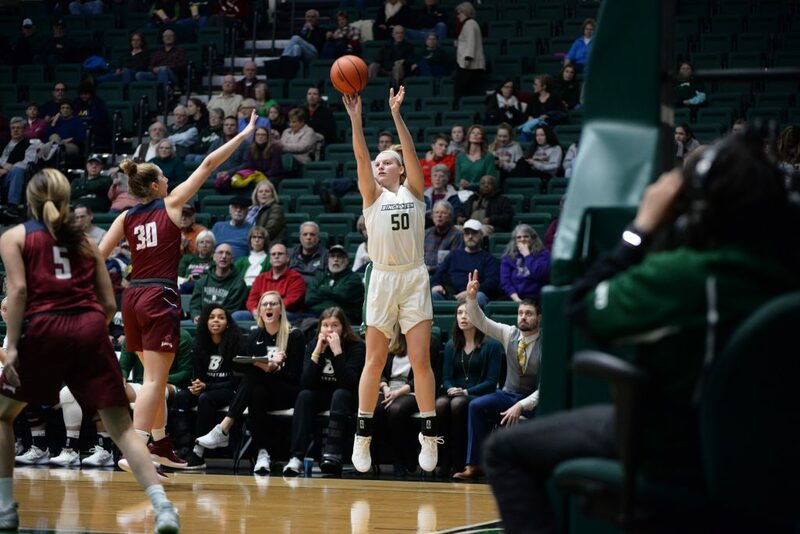 The Binghamton women’s basketball team dropped its second game in a row after surrendering a fourth-quarter run to the Stony Brook Seawolves. Impressive 3-point shooting kept BU (9-14, 4-6 America East) in the game for the first half against SBU (17-6, 6-4 AE), but buried them in the final period as the Bearcats fell, 68-53. The game marks the first time Binghamton has lost back-to-back games to AE teams all season as it slides even further down the conference standings. “This is a tough loss and an opportunity that we let slip away,” said BU head coach Bethann Shapiro Ord. The Bearcats did start the game off strong, leading the Seawolves 30-27 at the break. Binghamton scored the majority of its points from deep, notching 18 points from six-of-nine shooting behind the arc. Every time the Bearcats looked like they were about to pull away, however, Stony Brook found its way back in the game. The Seawolves even managed to tie the game up heading into the fourth quarter on a last-second 3-pointer by senior guard Shania Johnson. Then, in the fourth quarter, everything changed as Stony Brook took over the game. The Seawolves outscored Binghamton 27-12 in the final quarter. “This one hurts because we played a great first half and again, it’s got to be four quarters,” Shapiro Ord said. Stony Brook dominated the boards, recording 15 rebounds to Binghamton’s six and managing to outscore BU 9-0 on second chance points in the fourth quarter. Everything seemed to go wrong for the Bearcats in the fourth as they trailed in nearly every major category. The dagger for Binghamton was Stony Brook’s five 3-pointers in the fourth period alone, four of which were scored by senior guard Jerell Matthews. Based on Shapiro Ord’s postgame comments, a lack of aggressive play hurt the Bearcats in the fourth quarter. The game in many ways was a microcosm of the Bearcats’ season so far. They fought hard for the first few quarters but looked like another team in the fourth quarter. This team has been up and down depending on the game, alternating between wins and losses in AE play until last night, when they fell for the second time in a row. Even though Binghamton has been by routed impressive teams like Maine, it rebounded to take down equally impressive AE opponent Hartford. They have shown they can play at a high level against solid teams, but have not yet been able to find consistency. Two players who will need to continue improving to bring this team that consistency are junior guard Kai Moon and senior forward Rebecca Carmody. Moon has only played a few games since coming off an injury and is still working herself back into the mix, scoring seven points last night. As she gets back into a rhythm, she will be an important piece for the Bearcats moving forward. Carmody recorded 14 points on the night, moving her career total up to 980 points. She stands just 20 points away from becoming the 17th player in program history to score 1,000 points. A career-high 14 points by sophomore forward Kaylee Wasco marked another positive showing for BU. Binghamton currently sits at sixth in the AE following the loss, as it looks to get back on track against New Hampshire this Saturday at home. New Hampshire (5-18, 2-8 AE) currently sits at eighth in the conference. Tipoff against UNH is set for 2 p.m. from the Events Center in Vestal, New York.